We’d love your help. 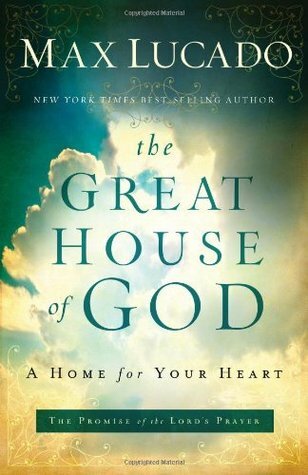 Let us know what’s wrong with this preview of The Great House of God by Max Lucado. God's greatest desire is to be your dwelling place - the home for your heart. He doesn't want to be merely a weekend getaway. He has no interest in being a Sunday bungalow or even a summer cottage. To ask other readers questions about The Great House of God, please sign up. An excellent look at the Lord's Prayer. The chapter about getting even really spoke to me, and inspired me to make some serious changes in my way of thinking. My husband and our friend love this book. I think it depends on where we are in our spiritual walk. I think some days it might feed me and others, I'm left dry. Well laid out and good use of the Lord's prayer to walk us through God's house. Excellent book...taking the Lord's prayer and breaking it down in segments. Max Lucado takes the reader on a journey of how we are to live daily in God's great house. You will be blessed! Similar to “My Heart, Christ’s Home,” Lucado takes us through the rooms of our heart, one by one, showing us how God meets us there in a unique way. This was my “Sunday reading” book, great for meditation and contemplation! When I realized that this book takes The Lord's Prayer and uses it as a floor plan of the House of God, I remembered hearing a similar sermon many years ago. Since the publishing date is 1997, perhaps my pastor used Lucado's book as a guide for that sermon. Good idea, I say! Max Lucado takes an in-depth look into the most famous prayer. He breaks down The Lord's Prayer by words and phrases. He entertains with scripture and personal anecdotes which reminds the reader of the greatness of God. Includ When I realized that this book takes The Lord's Prayer and uses it as a floor plan of the House of God, I remembered hearing a similar sermon many years ago. Since the publishing date is 1997, perhaps my pastor used Lucado's book as a guide for that sermon. Good idea, I say! Included is a chapter-by-chapter study guide with three sections for each chapter: Let Us Ponder, Let Us Prepare, and Let Us Pray. This book can be used as a personal devotional or for a group study material. The imagination of God's grace is presented beautifully and romantically by Lucado, via analysis of the "Our Father..." I had never imagined such beauty and such a visualization of the heart of God. Max Lucado is just about my Super Hero of Christian-living authors and ministers. Never has one of his books or of his teachings been a disappointment to me. A very good book that takes the Lord's prayer as a blueprint for a house and walks through each phrase of the prayer as a different room/part of a house. A very informative and accessible look at the Lord's Prayer. I think that as I repeat this prayer in the future, I will be more fully engaged and appreciative of each line. Our mansions in heaven, room by room. Did a Bible study on this one. Really great. I really enjoy Lucado's writing style and this book was no exception. Based on the Lord's Prayer, the imagery used to take you to a different room in God's House for every line was very effective. I won't think of the Lord's Prayer the same way again; it has taken on new life and I'm thankful to have it fresh in my mind. This book takes the reader through the various parts of the Lord’s Prayer giving examples of how to pray during each part of the prayer as well as fleshing out characteristics of God which can be found in each line or even word of the prayer. The simple writing style, vocabulary, and content left much to be added to this book. Beautiful Bible Study comparing the Lord’s Prayer to God’s great house. Went along well with some other books I am reading right now as we prepare to head into the Lenten season. If you have not read, I suggest you do. A helpful and simple way to study The Lord's Prayer. This book has helped me answer some questions my six year old has had about prayer and God. A lovely, slow trip through the Lord's prayer. As each phrase is examined, Lucado shows how God hides us safely in His heart, providing for our every need. Max brings the Lord’s Prayer to life. I’m so blessed to have the opportunity to review Max Lucado books, this one is yet another winner by my favorite nonfiction author! Like many Christians, I have the Lord’s Prayer memorized but Lucado’s book opened my eyes to even more ways to consider this prayer in my walk with Christ. He starts out with a simple description of a home inspection of our spiritual home-thoughts and truths and convictions and hopes. God’s house=God’s presence. Some of the first scriptures Lucado uses are John 14:23, Acts 17:28, and Matthew 28:20 (Lucado uses different versions of the scriptures but most of them were from The Message). He then uses each chapter to describe different parts of the house and how they are used in the Lord’s Prayer: the living room, the foundation, the observatory, the chapel, the throne, the study, the furnace, the kitchen, the roof, the hallway, the walls and so on. and the banner that guides the soldier. Two characters Lucado describes in detail are Job and Esther (many others are mentioned as points of reference, but those two stood out the most for me). Just when you think you KNOW the Bible cover to cover, Max puts in a new perspective that helps us see the connection to problems our ancestors faced compared to today’s problems. I want to thank BookSneeze.com and Thomas Nelson for the review copy they provided. I was not required to write a positive review. The opinions expressed are my own. This is a devotional book about The Lord’s Prayer. This is the much loved prayer taught by Jesus. However, the saying of The Lord’s Prayer may start to be said by rote, with not much thinking done about the words being recited. This book wants you to slow down, think about the words, understand who God is, and how He wants to bless us. The prayer is examined line-by-line, and a chapter is devoted to each line to look in-depth at the meaning. The author is a talented writer who communicates his id This is a devotional book about The Lord’s Prayer. This is the much loved prayer taught by Jesus. However, the saying of The Lord’s Prayer may start to be said by rote, with not much thinking done about the words being recited. This book wants you to slow down, think about the words, understand who God is, and how He wants to bless us. The prayer is examined line-by-line, and a chapter is devoted to each line to look in-depth at the meaning. The author is a talented writer who communicates his ideas clearly. He goes through the prayer using examples from everyday life that are easy to relate to. He talks about God being our dwelling place, and extends that idea using the Lord’s Prayer. Max compares different parts of the prayer to different rooms of a house–God’s house, a place that He wants you to be a part of. This is a good book, and easy to read, although the subject matter makes you think. If thoughtfully read, it will give you new insight into The Lord’s Prayer, as well as, the love God has for each of us. There is also a good study guide at the end of the book that could be used for a group, or individually, for an even deeper experience. I give this book five stars, and recommend it for anyone who wants a fresh look at The Lord’s Prayer, and the blessings that come from it. The publisher has provided me with a complimentary copy of this book through Thomas Nelson Publishing for the purpose of review. All opinions expressed are my own, and I have not been compensated in any other manner. Despite my receiving the book free, it has not influenced my judgment, and I have given an honest opinion. The house analogy doesn't always work, but Lucado still has some good points. Did you know that God has built a House for your soul – a home for your heart? Just as you have a physical house to shelter your body, God has provided a Spiritual home to shelter your heart and house your soul. The Lord’s Prayer sets this expansive floor plan in “The Great House of God,” while author Max Lucado takes you on a captivating room by room tour through the grandest and soundest of shelters you could ever know. Also included is an excellently detailed study guide that would make this an ideal book for small groups or book clubs to go into a deeper study or discussion of presented topics chapter by chapter. I really, really enjoyed this book. Comparing our relationship with God to a house that He has was a very concrete visual for me. I have always enjoyed Max Lucado books because in many ways he reminds me of C.S. Lewis. I appreciated many of his examples of how our Father loves us no matter what in His living room. The kitchen is a place where we can ask God to provide for us “just for today”. One of my favorite examples is how his daughter gave a pretzel to someone that had done something annoyi I really, really enjoyed this book. Comparing our relationship with God to a house that He has was a very concrete visual for me. I have always enjoyed Max Lucado books because in many ways he reminds me of C.S. Lewis. I appreciated many of his examples of how our Father loves us no matter what in His living room. The kitchen is a place where we can ask God to provide for us “just for today”. One of my favorite examples is how his daughter gave a pretzel to someone that had done something annoying to her dad, the author. Overall, this book is one I would read over again. The concepts are clear and concise. I don’t agree with every single analogy that Lucado uses; that being said, I do think he makes marvelous comparisons in what we use every day (our house) and how we can use those ideas to improve our relationship with God. There was a “pondering” guide in the back that I also found helpful to make me think about my own relationship and how it can improve. My favorite chapter was the one about the furnace and how God is there with us in the fires if we allow him to be. Mr. Lucado starts with the fact that we are adopted by God, he is our adoptive father, and will not abandon us whatsoever. Then in Chapter 3 we move on to faith, and how we can trust God. Max breaks down the Lord’s Prayer into detail, using it as a guide to God's House. We are not talking about an earthly house but His house, living within Him! It really is amazing how Max Lucado takes you right through the front door to explore the whole house and even up to the roof, to see how God has built it specifically for you. I really enjoyed this book, especially the chapter “The Hallway” where he once again takes us on that walk of grace and forgiveness. Also included is a study guide in the back of the book. I received a review copy from BookSneeze, and I was pleasantly surprised with this book. It was a light, but compelling read. It provided a very informative and accessible look at the Lord’s Prayer. The Prayer is broken down, and verses are explored as different rooms. It is a very unique way of exploring faith. By putting a story to every verse, the reader has a better understanding of everything this prayer encompasses. A good read to recommend to those who are feeling lost, and searching to r I received a review copy from BookSneeze, and I was pleasantly surprised with this book. It was a light, but compelling read. It provided a very informative and accessible look at the Lord’s Prayer. The Prayer is broken down, and verses are explored as different rooms. It is a very unique way of exploring faith. By putting a story to every verse, the reader has a better understanding of everything this prayer encompasses. A good read to recommend to those who are feeling lost, and searching to renew their faith. Taking the floor plan of a house, Lucado relates it to the Lord's Prayer - from worship to provision for needs and back to worship. Each phrase of the prayer is related to a different room in the house. Typical of his writing using anecdotes and stories on himself, this is a light and easy read with enough to think about to keep you engaged.